Rolfing seeks the overall alignment of the body’s structure. Rather than focusing only on symptomatic or painful areas of the body, Rolfers work throughout the body with the intention of integration. We understand that painful symptoms in the body often indicate compensation for structural imbalance or instability in areas distant from the symptoms. Massage or bodywork treatment in the symptomatic area alone may yield only temporary relief. A Rolfer will note where your symptoms are, but will view the symptoms in light of the whole body and work to free restrictions in your overall body pattern. A Rolfer’s goal is to elicit balance and support for the whole structure, so parts of the body don’t just relate to other parts, but are functioning as a unified, integrated whole. Typically, a Rolfer accomplishes this goal in a series of sessions. Dr. Rolf, over years of observation of how the body best responds to and integrates structural change, developed a sequential approach to align the body in the gravitational field. She organized the work into 10 segments. Each segment builds upon the last and prepares the body for the next. The initial three segments address the superficial layers of the body’s connective tissue. Segments four through seven free restrictions in the deeper structures of the body. The eight through tenth segments balance and align the body as a whole, and encourage the adoption of new patterns of movement that utilize the increased mobility and flexibility achieved with Rolfing. Dr. Rolf’s Series is a collection of goals rather than a fixed set of techniques. The Series guides a Rolfer in understanding and working with each person’s unique structure. Although session content, length, and number may differ depending on the needs and structure of each client, there are certain guidelines and landmarks that characterize a series. The Rolfer uses this recipe and the principles of Rolfing to plan and guide the work. We approach with the intention of releasing the superficial fascia from its chronic pattern and allowing for a fuller expression of breath. This is accomplished by freeing the superficial tissues in the ribcage, shoulder girdle, pelvis and thighs. Clients often report feeling lighter after the first session. We address your foundational support in the legs and feet. Through manipulation and movement, the tissues of the lower leg and foot are opened and balanced. Clients report feeling more balanced and grounded in standing and walking after this session. We address the lateral aspect of the body, typically from the pelvis to the shoulder girdle. We work to enhance dimension and balance between the front and back of the body, and to differentiate the shoulder and pelvic girdles from the trunk. Afterwards, clients usually feel taller, slimmer and more mobile. The fourth through seventh segments represent a shift in intention to the deeper or “core” layers of the body. Core layers are those that lie closest to the spine and body’s midline. We return to the legs. We work along the inner leg and thigh, differentiating fascial compartments, and organizing them in relationship to the foot and pelvis. The newfound freedom and sense of connection between foot, leg and pelvis creates a sense of lift in the spine and torso. We continue our focus on bringing the pelvis into balance and lifting through the core. Work in thighs, pelvis and abdomen frees restrictions that inhibit pelvic movement, allowing the pelvis to come into horizontal balance, and support the structures above. 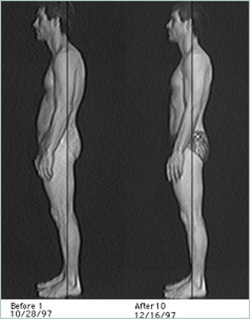 Clients report feeling a sense of space in the abdomen, and feel it is easier to maintain an upright and lengthened spine. Seven continues the opening of the core space through the neck and head. We work on the fascia in the neck, skull and face. By this time in the series, clients usually get a sense of their whole body as being changed. People feel more effective and at ease. In our sessions until now, we have worked to free restrictions in particular areas of the body. The intention now shifts to integration of segments into the whole. We relate the lower body to the core, and then the upper body to the core, emphasizing fluid and efficient movement. We have related each half of the body to the core. Now, we encourage movement through the core. As the body adapts to new ways of being, we conclude the initial manipulation series and observe how changes unfold. The changes initiated by this initial work will continue for months, even years, after the series. We conclude the series at a point at which a plateau has been reached. At this point, it is suggested clients take a break from Rolfing manipulation and allow changes to be integrated into the structure and movement patterns. During the break from the structural work, I invite you to return for Rolfing movement education, which encourages economical movement and builds strength through the core. Movement sessions are tailored to your specific needs, whether it be athletics; walking, yoga, occupational movments such as computer work or equipment operation; driving, carrying children, etc. After a phase of integration, which is determined between client and practitioner, you may choose to return for structural tune-ups. Tune-ups may maintain the work of the initial series or may allow for the unwinding of deeper patterns that were not available in the initial work. Tune-up schedules vary depending on your needs, and range from bi-monthly to bi-annually. I often explain the Rolfing Series as like creating a filing system in the body. We take a desk full of random documents, and create a system of greater order so each document has a place. Once this initial filing system has been created, we don’t need to recreate it. In our bodies, as the inbox fills, sometimes we keep up with the system, sometimes we get behind. Some documents get lost, some stained with coffee, some arrive which might need a new category. Rolfing tune-ups offer assistance with getting the papers to their rightful files, maintaining the system or enhancing it as the situation requires.